How To Find The Right Watches For You? An expert at anything was once a beginner or a novice. Therefore you should not be shy or with little boldness whenever you find yourself in the market for a new wristwatch. 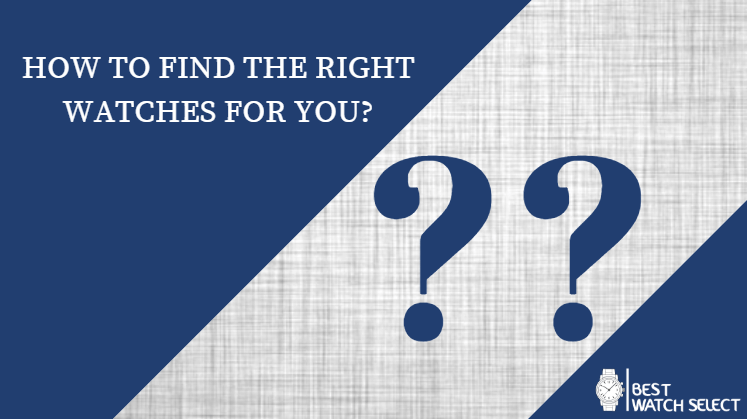 There are many challenges you are likely going to face when choosing the right wristwatch for you. You will find yourself in deciding the brand to choose, the quality of the wristwatch, the price, how trendy is the watch, the features, style and how it will complement your different outfits without you looking odd. So without much ado, how do you think you can find the right wristwatch for you without appearing like a novice to the seller and as well satisfy your need? Let’s run through some of the things you ought to know or do before going to the market. You will appear indecisive and vulnerable to me seller if you don’t know the kind of watch you want. If care is not taken, you might end up buying a wristwatch you will forever regret buying. To avoid such occurrence, you need to ask yourself and be too sure of the kind of wristwatch you want. Don’t be too in a hurry. Nothing is wrong with you taking your time to make research on a different kind of wristwatch in the market today. There are thousands of different types of watches available in the market with various functions. Some are unisex, and some are not. Some can be used for everyday use, sporting activities, casual outings, and formal events, so you need to know that which you intend to do with the watch before spending your money on any. The appearance of the watch embodies the shape of the watch and the material of the band. As regarding the face of watches, you are likely to find just two types of shapes such as a circle or square. The one you choose will depend on your preference and style. The other part of the appearance of watches is the material of the band. Some are made of metal with either gold or silver design, and some are made with leather. Most people choose a leather band wristwatch because it is lightweight and comfortable on the wrist. You need to consider this as it determines how you will read the time. It determines your relationship with your wristwatch. The digital wristwatch is represented in number form while the analog wristwatch uses minute and hour hands. Some people prefer digital watch because it is easier to read compared to an analog wristwatch. It takes time to understand analog wristwatch especially with those that only have a minute and hour hands. It has an in-depth understanding of wristwatches to be able to read that kind of watch. You should choose the type of wristwatch you can easily relate to. What is the use of having a wristwatch in which you can’t read what the time says? It is why you should consider this before making any purchase. Just in case you don’t know, a watch does more than just telling the time and checking the date. Some are sophisticated in which they come with additional features, but they are quite pricey compared to a standard wristwatch. Some will come with features such as timer, some are resistant to water and can be used in sporty events such as swimming pool and diving, some have GPS tracker which makes it ideal for pilots, Some have illuminated faces which makes it entirely more comfortable for you to read the time in the dark, some have an alarm system and some has a fitness tracker to monitor your workout routine. Brands determine the quality of a wristwatch. You will be doing yourself a great favour by purchasing any of the top brand wrist watches. There are different types of brands in the industry, and you should be more careful not to be blown away by sweet mouth sellers. Take your time to research the best brand of the type of watch you are about to buy and choose the best. Choosing the best brand will give you rest of mind, and you will be confident of the watch you have on your wrist. We choose to add this as the last thing to consider because it determines what you will get. Wristwatch price range varies based on the brand, quality and features. Some are quite expensive, and some are cheap and affordable. To get the best wristwatch, you must be willing to spend as quality products don’t come cheap. You don’t have to break the bank to get a wristwatch as you will find some with sophisticated features yet at affordable price. You have to keep searching until you see the best. Bulova Watches Review | Are Bulova Watches any Good?